Hardwood Floor Vacuum | What Features Are Right For You? A hardwood floor vacuum could be one of your most prized investments as a hardwood floor owner. Hardwood floors are already a snap to clean, but the right vacuum will make the job fast and thorough. What is the Best Vacuum for Hardwood Floors? We’ve interviewed many people who provide residential house cleaning for a living, as well as hardwood flooring contractors and wood floor owners. We’ve also done our own due diligence – experimenting, reviewing, and researching. Your ultimate choice in a wood floor vacuum will also take into consideration personal preference and perhaps your physical health. The best vacuum for wood floors may not be perfect right out of the box. Of ‘course, professionals don’t want to take any chances causing damage to their customers’ floors – but you can make modifications based on personal choices to protect your flooring. If the vacuum head is not cushioned, attach a heavy-duty strip of felt padding that you can cut exactly to size (just as shown to the left). Fully cover the portions and edges that rub along the floor to prevent scratching the surface of your floor. After each use, brush off the padding on the vacuum head to ensure grit isn’t stuck to the pad, which will scrape the floor. 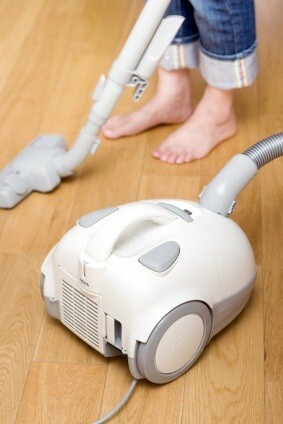 The best vacuum for wood floors will have the least amount of moving parts and pieces touching the floor itself. Our house cleaning professionals tell us to take a look at the wheels prior to each use. Keep them clean. Wrap them in masking tape or painters tape – something to protect the floor finish from scratches and skid marks. They suggest wrapping your vacuum hose in fleece or another soft material so the plastic isn’t dragging across the floor. Avoid black plastic whenever you can. White or gray is best for a hardwood floor vacuum. Next, we’ll review the benefits of different vacuum styles and offer specific product recommendations. Your wood floor vacuum may be your most prized household possession! It should save you time, it should perform well and it should protect your flooring investment. We are a participant in the Amazon Services LLC Associates Program, an affiliate advertising program designed to provide a means for us to earn fees by linking to Amazon.com and affiliated sites. Material on HowtoHardwoodFloors.com is copyrighted. Reproduction without permission is prohibited. All trademarks are the property of their respective owners.